Last week was my first time hosting our preschool coop group, and I took a bunch of photos. Yesterday, we had temperatures in the low 30’s, and I woke up to a frosty wonderland. I rushed outside to photograph the first frost of the year. I planned on including those photos along with photos of my current knitting project. Out of 41 photos, my computer was able to upload one. One. 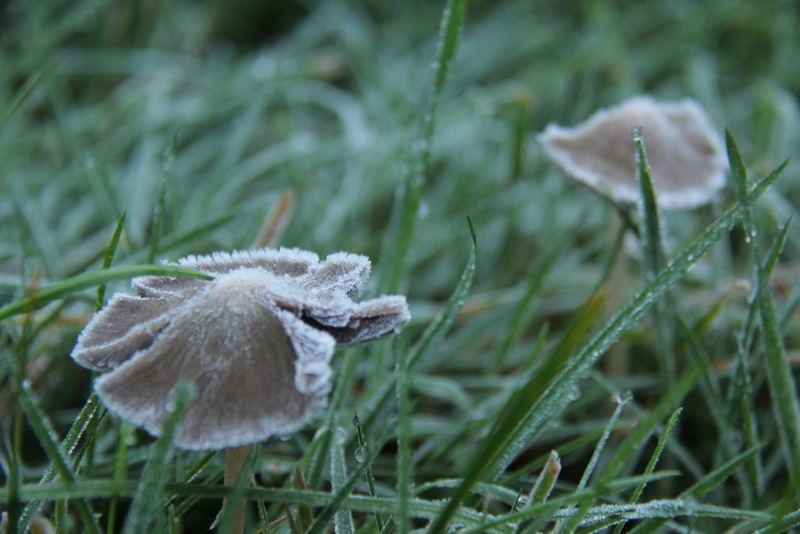 So here you have it folks: some frosty mushrooms. I’ll be posting a photo of my mittens on Instagram tomorrow. Hopefully purchasing a new card resolves this issue. It’s hard to blog when your photos are constantly disappearing. Technology sure is great…until it stops working. Is anyone else enjoying the colder weather? What’s on your needles? I think I’ll be at that for awhile. ha! Thanks for the encouragement. I’m hoping a new memory card will solve at least some of the problem. Regarding the weather, as I’m sure you know, the weather will change overnight and you will have many opportunities to wear all those lovely socks you’ve been knitting! I love following your progress. Keep those photos coming!